When I created this blog a short time ago, I’d convinced myself that I’d avoid getting political on it. It seems that was short lived; I’m finding it hard to suffer in silence about a topic I’m so passionate about. Road safety issues and sharing are coming to a head at the moment in Western Australia as the election cycle ramps up. This is spurred on by an antagonistic media cycle, determined to keep it’s viewership even if it’s at the expense of culture and safety. Road rage is a serious problem that I think is often trivialised. Sources like The Bell Tower Times, a satirical Facebook page (which I adore) like to play cyclists up as melodramatic. Suggesting that we behave as if we’re oppressed minorities, which is implied is not the case. However, it’s certainly not accepted in modern Australia that you could yell at a random passerby for their ethnicity, religion or sexual orientation. You most definitely can’t be tolerated for intimidating, throwing objects and veering a motor vehicle at them. 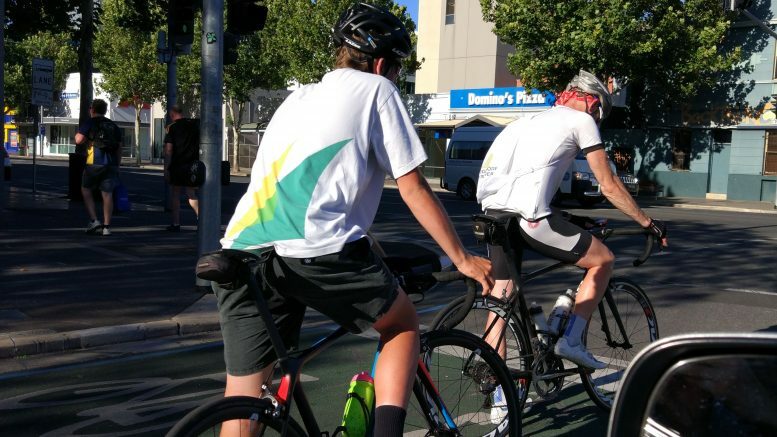 In Perth, any of the above is at a minimum a weekly experience for a dedicated cyclist. Sometimes it could be multiple times per day. The above is unacceptable. It’s not a civilised culture that allows this behaviour. The attitudes that it implies are born out in text all over the internet, it’s not imaginary. The easiest places to observe it are on the comment feeds of news pages or via the Facebook pages of 9 News, 7 News, A Current Affair and Today Tonight. I charge that no one in Australia has done more to harm the case of cyclists as legitimate road users than the 7 and 9 networks. They repeatedly run biased news pieces, intended to stir emotions as a means to bolster audiences. 7 recently ran a piece on Today Tonight based on an edited version of this footage. The rider in front being filmed is well known on the web as “Durian Rider” or Harley. Harley is known to be inflammatory but he has been endangered here. The cut used by 7 eliminated context of how close the pass was, showing the vehicle at it’s widest point. It repeated this piece of footage but placed a greater emphasis on Harley’s understandably angry reaction. It avoided showing that the rider behind Harley (filming) was passed even more closely. It completely glossed over the fact that there were oncoming cyclists. It did not attempt to calculate the distance of the pass using the known size of the lane, a 28″ wheel or handlebars – it asked audiences to make up their own minds. They provided edited footage of an expert being questioned on Harley’s subsequent behaviour and disapproving of it. All this adds up to an editorial begging viewers to be angry at cyclists. And the fastest cyclists are clocking more than 40km/h – a speed that could cause broken bones or serious injury for riders and pedestrians involved in a collision. The above is not without merit, however, it’s also completely true of driving a car at 60km/h. Less than 10% of the cyclists recorded were doing greater than 30km/h, which is frankly, a perfectly safe speed for anyone with a moderate amount of experience. For many cyclists, travelling in groups at 40-50km/h regularly with ~30cm separation between riders is routine. 30km/h on an open path is pedestrian. One should always act with deference to safety though and be aware not to intimidate other users of the path. Travelling at 30km/h or greater should only be done with metre or greater passing distance, slowing where this can’t be achieved. These are just a couple of examples of bias used to attract attention, at the cost of a normalised culture of hostility towards cyclists. I look forward to a day when we’re not used as a means to gain advertising revenue. It’s a pretty disgusting practice to knowingly stir such tensions, cycling is not the only instance in which this happens. Similar techniques are used against all sorts of demographics that are seen as out groups in society. The end result of all this is two polarised demographics, cyclists as a minority road user are victim to a minority of aggressive motorists. The media interferes and entrenches this dynamic. What we really need is to chill out, both sides. Everyone needs to do their part to legitimately share public resources. Not just repeat “share the road” with no intent. Cyclists should treat pedestrians with the same courtesy they would hope to receive from a motorist. Many motorists need to remember we are human beings and that they have the responsibility of operating a heavy vehicle for the safety of everyone, not just themselves. Cyclists need to acknowledge they are indeed slower in absolute terms and select routes and road movements with courtesy and safety in mind. 10 Comments on "Road rage and media bias"
Well written blog. I agree with your sentiment. I understand that Harley had reason to be upset. But his anger should have subsided before uploading the video. He done himself or other cyclists (myself included) no favors. Thanks. The short version is I don’t blame people like Harley at all for losing it in the sample I mentioned, I’ve been guilty of giving into the windup myself. Harley’s record is what shifts the perception and overall, I think (as much as it’s unfair) we need to take the high road as often as possible. Take them for a ride and let them see how dangerous it is. I firmly believe riding a bicycle should be a part of licensing for a motor vehicle. It gives a sense of perspective and it’s a low risk (to society) means of familiarising a learner with using the road. I think it would be enlightening and a sure fire way to cut dangerous habits. In Australia, infrastructure spends are a classic case of good money after bad. Due to the political involvement in major infrastructure, it has a tendency to be beholden to public opinion and election term length vision. RE: Helmet laws, I waver between being on the fence and against them. At a minimum I certainly recommend everyone to choose to wear a helmet, especially on the road. I don’t think it’s necessarily a great idea to make it a legal requirement, however it’s also not unreasonable to expect people to protect themselves from foreseeable injury that would be burdensome on a public health system. It’s ironic that helmet laws are so strongly enforced for the protection of cyclists whereas minimum passing distances are not generally enforced, even when video proof is supplied! Both important safety initiatives, but only one can be controlled by the at risk party. I will say that VicPol did seem interested in pursuing a case I made for a close pass received while surveying the nationals TT course. However, I was forced to drop the case due to a requirement to attend court should the perpetrator plead not guilty. Absolutely agree that keeping the big steel cages away is of greater significance. Respect is the perfect word. Cyclist and motorist has the same right to drive. When we are all responsible driver, road rage can be avoided. You are right Patrick, when we see the news and read the newspaper in the morning, road rage incident are real. It’s mind blowing, others end up on emergency room and others inside the jail. Stay calm on the road, because others are not.